As mentioned by our very observant Sterkoder, the most wonderful looking yacht by the name of GRACE visited Trondheim today. I also spotted this yacht in the waters off Bodø a few weeks ago, but being on duty, I could not find the time to photograph her. Here are two photographs I took of this yacht this morning in Trondheim. 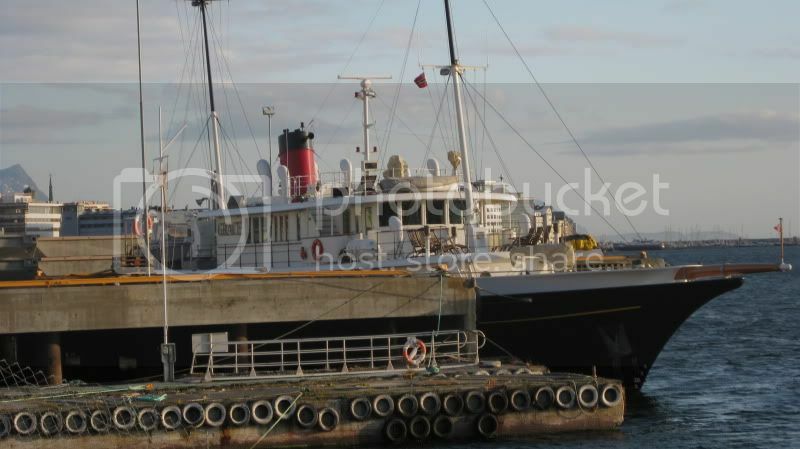 She is registered in Rotterdam and is a fantastically looking vessel: very well cared for and all details have a historical whim of them: from the railing, to the decklights and all other fittings. If anyone sits on more information about this vessel, I'd love to hear from you in additional posts. Quiz: Guess what's not compatible with the interest shipspotting and photography? I'm temted to tell you right away, but let this be a little competition through the evening. Unfortunately I only found som very BAD spotplaces to catch GRACE in Bodø. But at least I got her. Certainly a great looking yacht, classical yet so modern. For your quiz, I have absolutely no idea... (maybe because I'm on the slow side today... ). E's back...so all together now..."She's so.....PRETTY!" A fiancé and daughter TOTALLY not interested in shipspotting, and "Grace" being docked a 10 minute drive outside our pre-planned route from Kristiansund to Verdal! Ok, I first read "fiance" as "fiancee" and I went ...but I must assume that you mean daughter and daughter's fiance??? That should make a family of three, where a fiancee and a daughter don't care much about shipspotting. Last edited by Sterkoder; August 1st, 2009, 22:20. Why Svein, you old devil!!!! Seems like a nice, neat package. oh, my dear, my dear....I'm not talking credit cards...wait until BOYS and HORMONES really kick in...and YES, "tseira" I am talking about YOU!!! Sterkoder..you will always have a shoulder to cry upon with me. Watched the last programme on NRK called "Der fartøy flyte kan" (episode 8:8) where a large part was dedicated to talk about "Grace" and being on board. On that programme she had a straight vertical bow as on old time steamers, while today she has a forward pointing bow with a spear, just like a huge sailship. Well worth a look is also the old rebuilt yacht once belonged to the former norwegian Prime Minister Christian Michelsen, Yacht "Faun". Last edited by Sterkoder; August 13th, 2009, 21:59. Great observation... you certainly have good detective eyes. Ever thought of becoming a private investigator or a spy (maybe you are, but you can't tell us, because then you would have to kill us... ). The bow is most certainly rebuilt as you can see. No idea when.